Fair Weather or Stormy Weather Trending? Barometers are instruments to measure the pressure of the atmosphere to determine the conidtions to forecast the weather. A higher reading indicates fair weather and a lower reading will indicate storms or high winds. Most have a needle to mark the current barometric pressure and then one may watch the pressure rise or fall from the point where they set the needle. All Barometers include Free Shipping! an accurate Quartz Clock for time and a large dial barometer to reading minor changes in the barometric pressure. There is also a bi-metal hygrometer to indicate an average level of humidity. Dials are encircled by polished and lacquered brass bezels and easy to read convex glass crystals cover the barometer. Quartz, battery operated movement. Size: H. 31" W. 8-1/2" D. 2-1/4"
Howard Miller Shore Station 625-249 Clock, Barometer, and Thermometer. This weather station wall clock combines a clock, barometer, and thermometer. White dial features black numerals and a polished brass tone bezel. Finished in Rosewood Hall on select hardwoods and veneers. One year warranty and Free Shipping. Quartz, battery operated movement. The Skipjack is a unique desktop combination clock/barometer. Nowhere else will you find a double instrument like this! Housed in one traditional forged brass case, this compact combination clock/barometer swivels 360° horizontally and vertically in a brass, perfectly balanced and integrated gimbal. The gimbal allows for comfortable viewing from any angle. Lifetime warranty and Free Shipping. The new Endurance II Barometer is light, strong and guaranteed not to tarnish or scratch because of it's maintenance free, ultra-hard protective coating. This is an aneroid type which measures atmospheric pressure mechanically without the use of liquids. The movement in this midsize barometer is temperature compensated, fully adjustable with inch and millibar scales, and is calibrated for altitudes to 3,500 feet above sea level. The dial face opens with your traditional porthole front opening bezel with a Beveled glass crystal to protect the dial. 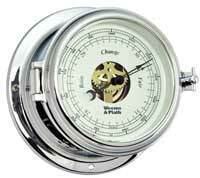 Flanged back provides a mounting methods wall, boat or display as a table barometer. Our 135SM single wood base in mahogany finish sold separately. Lifetime warranty on finish and movement and Free Shipping. 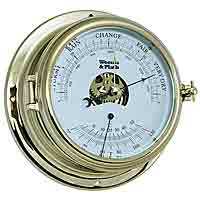 Size: Dimensions: Width 6", Dial - 4", Base - 7" Depth - 3 1/8"
Temperature compensated, aneroid movement. Fully adjustable. Inch and millibar scales. 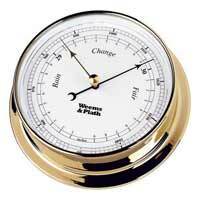 Our standard barometer movements are calibrated for altitudes to 3,500' above sea level. Size: Dial: 4-7/8". Base: 6". Depth: 1-5/8". Size: Dial - 5" Base - 7" Depth - 2 1/2"
The new Endurance II barometer is light, strong and guaranteed not to tarnish or scratch because of it's maintenance free, ultra-hard protective coating. 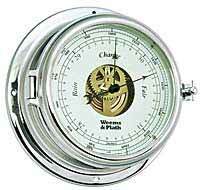 the Endurance II Chrome Open Dial Barometer is an aneroid type which measures atmospheric pressures mechanically without the use of liquids. The dial face opens with your traditional porthole front opening bezel with a Beveled glass crystal to protect the dial. The movement is temperature compensated, fully adjustable with inch and millibar scales. This barometer is calibrated for altitudes from sea level to 3,500 feet. Flanged back provides a mounting methods wall, boat or display as a table clock with our 135SM single wood base in mahogany finish sold separately. Lifetime warranty on finish and movement and Free Shipping. Size: Dimensions: Dial - 5" Base - 7" Depth - 2 1/2"